The more you roll, the finer the garlic. Genius. Ideal for flavour freaks looking to minimise garlicky fingers and stinky surfaces, this nifty little gizmo makes chopping garlic fun and easy. Simply open the top, pop in a peeled clove and push the Zoom backwards and forwards on your worktop. The more you roll, the finer the garlic. Next, open the lid, give it a tap and watch in wonder (well, sort of) as the itty bitty garlic bits fall out. Genius! Experience the difference in taste between freshly pressed and sliced garlic using this fantastic tool. 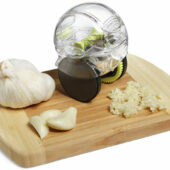 The Garlic Slice ’n’ Press features an integrated slicer for perfect garlic slices in seconds, and a unique press design that easily removes garlic skin. It’s made from heavy-duty cast zinc that’s robust and dishwasher safe. 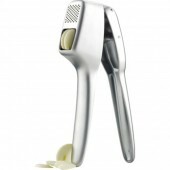 The Garlic Slice ‘n’ Press is 35mm in width, 50mm in height and 185mm in length.